Buying Instruments for Underprivileged Youth! At the age of 15, Catie was given the gift of a used guitar on the premise that she promise to learn to play it. In order to "pay it forward" Catie started the “Aspire to Inspire” initiative to provide funding to the ASCAP (American Society of Composers, Authors and Publishers) Foundation to purchase instruments for budding young musicians who can’t afford to buy their own. Catie and friends donated funds totaling over $10,000. 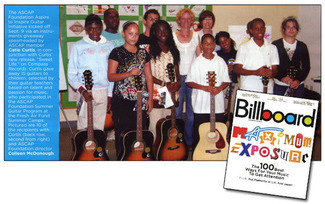 In 2008, the fund purchased instruments for 12 young people from Fresh Air Camps who demonstrated a passion for music. The following organizations have received checks from Aspire to Inspire, via the ASCAP Foundation for over $1200 each to buy instruments for kids. All of the Aspire to Inspire funds have been paid out, and Catie will soon start another initiative!